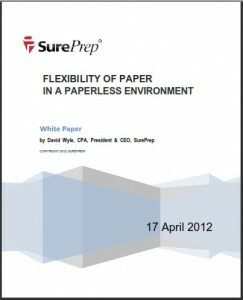 With our third and biggest annual Cloud Summit behind us, we will be recapping the benefits proffered by the Summit’s showcase vendors, beginning with an overview and white paper from SurePrep, a cloud technology that garnered a lot of excitement among attendees for its paperless tax preparation platfor..
White Paper author David Wyle, CPA, leads the SurePrep team as president and CEO. Prior to SurePrep, he founded ePace! Software and was a CPA with the accounting firm of Coopers & Lybrand. Over the years, David has emerged as a leading voice in the tax and accounting profession, specifically in the areas of the paperless office. Over the last decade, the accounting and tax professions have undergone a slow and steady evolution to the paperless office—a transition that began in the area of audit. As audit professionals started to reap the rewards of more efficient, paperless tax preparation workpapers, tax practitioners took note and soon followed suit—putting the tax department at the center of the paperless movement. In the last few years, the advancement of OCR (Optical Character Recognition) technology and improved scanning processes have allowed firms to transition to a far more efficient and time-saving digital paperless tax preparation process. The evolution to a digital process represents positive change in the profession. However, in exchange for the convenience of a paperless tax prep work environment, firms gave up much of the flexibility offered by hard copy documents. With traditional paper-based processes, practitioners used a common medium (paper) and a uniform review tool (the pencil). Today, the best of both worlds is available—the flexibility of paper and the efficiency of an electronic process. Digital binder technology found in advanced applications like SPbinder supports an end-to-end paperless workflow, while also allowing practitioners to work with files at the individual page or element level. Firms can standardize processes, develop a unique workpaper indexing structure, and cross-reference pages across as many workpapers as needed (even if the workpapers are from different file types). While the paperless evolution continues, the organizational flexibility of paper in a completely paperless tax preparation environment is a significant marker. Moving forward, firms can benefit from the cost and time savings that a digital work environment offers, while leveraging the value of the time-honored paper-based approach. Remember Cloud9 Real Time, the #1 Accounting, Bookkeeping and Tax Preparation Cloud Computing solution voted in four different polls by more CPAs and accounting professionals. Get a service quote and/or a free 7-day demo – find out what all the hubbub is about!